Kingman Historic Theatre: Planes: Fire & Rescue is showing this weekend at the Kingman Historic Theatre! Planes: Fire & Rescue is showing this weekend at the Kingman Historic Theatre! This weekend the Kingman Historic Theatre will be showing Planes: Fire & Rescue at 7:30 P.M. on Friday (August 1), Saturday (August 2), and Sunday (August 3). This movie is rated PG and stars Dane Cook, Ed Harris, and Julie Bowen. When Dusty learns that his engine is damaged and he may never race again, he joins a forest fire and rescue unite to be trained as a firefighter. 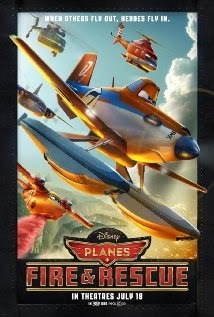 Check out the Planes: Fire & Rescue trailer.